WARNING: Shipping water based adhesive during winter months is less than ideal. We do our best to keep water based product from freezing during transport. Liquids (water based polyurethane or water based adhesive) CANNOT be drop-shipped during winter/cold months. It is the client’s responsibility to bring all liquids in side at the time of delivery and inspect the water based adhesive at time of delivery (open the carton to ensure the product is still in liquid form). Should product arrive “frozen” (in a solid state – not liquid) or damaged, Cancork Floor must be notified within 48 hours of delivery. Failure to inform Cancork Floor inside of 48 hours of damaged/frozen product negates the client’s ability to file a claim for replacement product with Cancork Floor, Cancork Floor or Forna. Water based adhesive or Water based contact cement for laying cork flooring, waxed and pre-sealed cork tiles without coated backing, on absorbent and non-absorbent subfloors as well as on permanent, existing floor coverings indoors. For skirting boards as well as for laying carpets and PVC flooring on steps. The subfloor and the room climate conditions must satisfy the requirements of DIN 18365. Subfloors must be level, permanently dry, firm and free from cracks, dust, dirt and adhesion-inhibiting substances. Existing floor-coverings must be glued well and must have a smooth surface free from wax and care products. 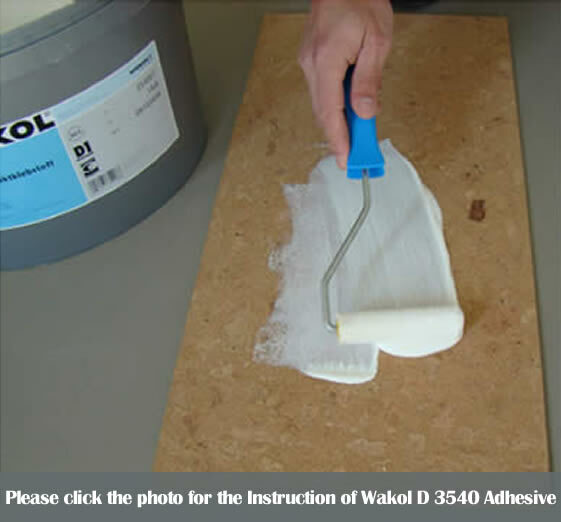 For laying cork-materials with WAKOL D 3540 the subfloor must be smooth and level. Rough and unlevelled surfaces must be leveled. Stir adhesive well before use. Apply evenly and fully to subfloor and cork backing with a velour roller; avoid adhesive pools. Make sure that the applied amount is sufficient to form a complete film of adhesive. The surfaces must show a closed, evenly glossy film when the adhesive has dried. As soon as both adhesive films are dry and completely transparent, lay down the cork tiles to fit and knock tightly with a rubber hammer. The laid tiles are immediately suitable for walking. Natural cork can be surface sealed after 24 hours. Cork tiles can be pre-glued with WAKOL D 3540 or WAKOL D 3513 before laying. On the laying day the adhesive is simply applied to the subfloor and after ample waiting the pre-glued cork tiles are stuck in the contact method. The open time is reduced to 60-90 minutes in this case. Do not use water based adhesive below + 15° C. During cold weather periods warm up floor covering and adhesive in due time. 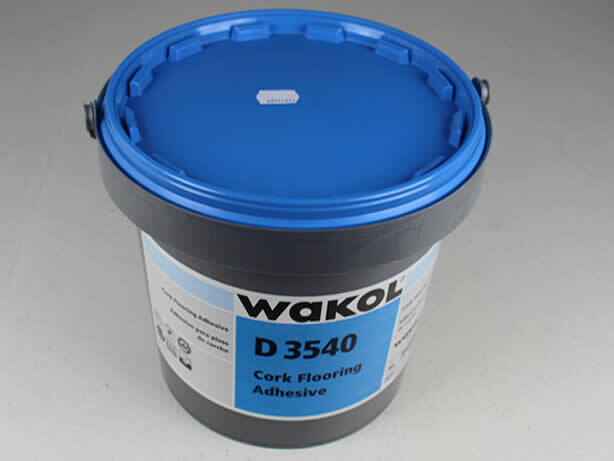 WAKOL D 3540 Water Based Adhesive Guide. Why Choose Factory Finished Cork Flooring over Unfinished Cork Flooring?